This birth injury claim was filed in Baltimore City against St. Agnes Hospital after a newborn suffered hypoglycemic brain damage. It was filed in Health Claims Arbitration on March 6, 2018, and it is the 107th medical malpractice case filed in Maryland this year. Another birth injury lawsuit filed against St. Agnes. This case involved the failure to act after the fetal heart monitor showed a fetus in distress. A 29-year-old woman presented to St. Agnes Hospital after her water broke at 36 weeks of pregnancy. Given her documented history of gestational diabetes, her health care providers should have performed glucose checks throughout the course of her labor. If the hospital staff had performed regular glucose checks, they would have recognized the woman's abnormal results and provided an insulin drip to regulate her blood sugar levels. Unfortunately, the hospital staff never performed any glucose tolerance tests whatsoever and the woman's baby was born in a depressed state, requiring suctioning, stimulation, and transfer to the Neonatal Intensive Care Unit (NICU). Bloodwork revealed that the baby's glucose levels were seriously low and dropping. If the appropriate glucose testing was performed during labor and delivery, the baby would have been born without hypoglycemia. Because the mother's blood sugar levels were abnormal during delivery, her baby was born in a severe hypoglycemic state which led to significant and permanent disability. The baby was provided with dextrose (sugar) in the NICU, but he was still exhibiting blank stares, low oxygen saturation levels, and left-sided twitching. The day after birth, brain imaging revealed an injury to the baby's occipital lobes. Later that day he was transferred to another hospital for seizure activity, and additional studies confirmed the presence of hypoglycemic brain injury. According to a study published in Translational Pediatrics, persistent hypoglycemia may lead to long-term visual or hearing impairment, cognitive abnormalities, secondary epilepsy, and other central nervous system disorders. The severity of a neonatal hypoglycemic brain injury (NHBI) can even exceed that of a hypoxic-ischemic injury. Rather than simply starving brain cells of glucose, hypoglycemia can also kill neurons by releasing a neurotoxin from the brain tissue and cerebrospinal fluid. Brain cells in the visual cortex and the central nervous system are particularly vulnerable. Mild hypoglycemia in an otherwise healthy fetus may not be sufficient to cause injury. But the more severe the hypoglycemia, the more likely injury will occur. Neonatal hypoglycemia is diagnosed when plasma glucose levels are less than 35mg/dL (term) and 25mg/dL (preterm). The fetus in this lawsuit had test results ranging from 28-51. Why do sugar levels matter so much? Glucose is the primary fuel to the brain. So glucose is crucial for the brain's energy metabolism. If the fetus has protracted and severe hypoglycemia, the result can be brain damage. Doctors do not fully understand all of the nuances but fetus neonatal hypoglycemia may be caused by the overproduction of insulin by the fetal pancreas that has been stimulated in utero by significant hypoglycemia. Often a child can suffer neonatal hypoglycemia with any long-term consequences. The odds of a good outcome go down significantly when the child has seizures as this baby had. One problem for defendants is that the standard of care requires not only a glucose tolerance test but repeated tests after her admission if she was at high risk for gestational diabetes. Failing to regularly test for glucose tolerance during labor and delivery. 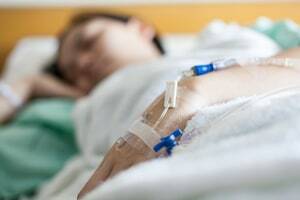 Failing to provide an intravenous insulin drip during labor and delivery. As a direct result of the defendants' negligence, the baby will suffer the emotional, physical, and financial damages associated with a severe and permanent brain injury. Read more about hypoglycemic birth injuries.